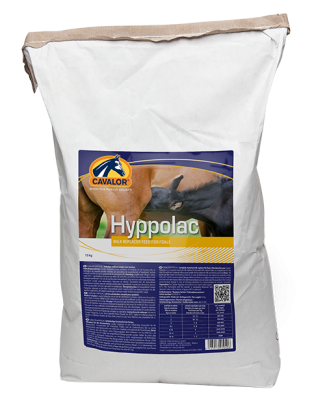 Cavalor Hypolac is a complete, premium line maternal milk replacer for foals. It can also be fed to lactating mares to increase milk production, or older horses to aid weight gain. Cavalor Hypolac is a complete milk replacer from diary origins. The nutritional values when correctly diluted are equivalent to average mare milk. It can also be fed to lactating mares with insufficient milk, to increase milk production. Cavalor Hypolac is energy rich and contains high grade vitamins (A, D3, E, C)and minerals (Calcium, Copper, Iron, Manganese, Zinc, Selenium) alongside essential amino acids (Lysine, Methionine). Number of meals per day and volume of liquid per meal will vary greatly with age, health and breed. Please consult your Veterinary Surgeon for precise feeding instructions.